We would certainly recommend and will definitely return in the future. Great base for exploring the Isle of Wight. Our cottage was clean, spacious and well laid out , home from home feeling. My son enjoyed the pool especially the Wet'n'Wild and Water Polo activities. Plenty of other free activities to enjoy and keep him off the iPad and get some fresh air. All the staff interacted with were friendly and helpful .Sarah the Guest Services Manager was particularly efficient . I needed to print ,sign and return an urgent contract. Beth and Sarah completed the tasks, genuinely appearing pleased to help. I couldn't have asked for more. Will definitely return to unwind and have fun, knowing I have Sarah and Beth in to help ! These single-storey, two bedroom cottages with one double and one twin, offer excellent family accommodation for four guests. The homes are generously proportioned, well-equipped and designed to maximise space. Relax and unwind in our cosy open plan living area, perfect for enjoying down-time with family or friends and each home has access to the gardens with an outside decking area with tables and chairs. 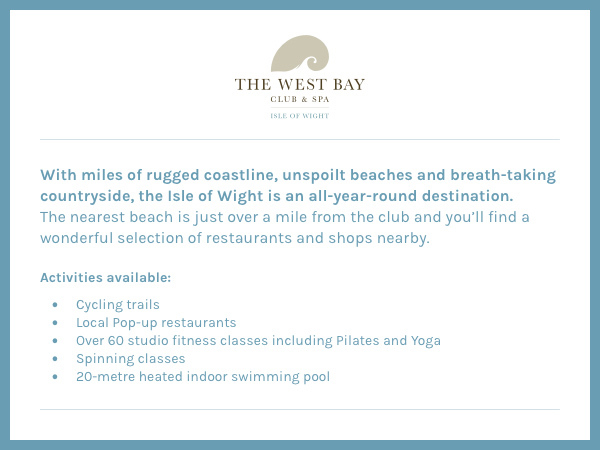 The West Bay Club offers a wide range of activities, many of which are included in your price. Break a sweat in one of the 60+ fitness classes including spinning, insanity and yoga. Enjoy family fun in the sports hall, have a dip in the pool or sample the delicious home-made menu in the café made with fresh local ingredients. The Island Wellness Spa offers treatments designed to improve health and vitality and leave you relaxed and refreshed. A break at The West Bay Club will be unforgettable. All ground floor. Two bedrooms: 1 x double, 1 x twin. Shower room/Bathroom with either shower, basin and WC or bath with shower over, basin and WC. Open plan living area with kitchen, dining area and sitting area.